Church culture change is hard! Our congregation had Sunday School at the same time as worship for decades. That changed almost 10 years ago, but we are still finding that families have a hard time feeling welcome in worship. The culture for including children has not yet changed. A team of people decided to make some small steps to work on that. First, we added a “rock and bounce” area in the narthex. A couple of rocking chairs and space to walk with a fussy baby while still being in the worship space. 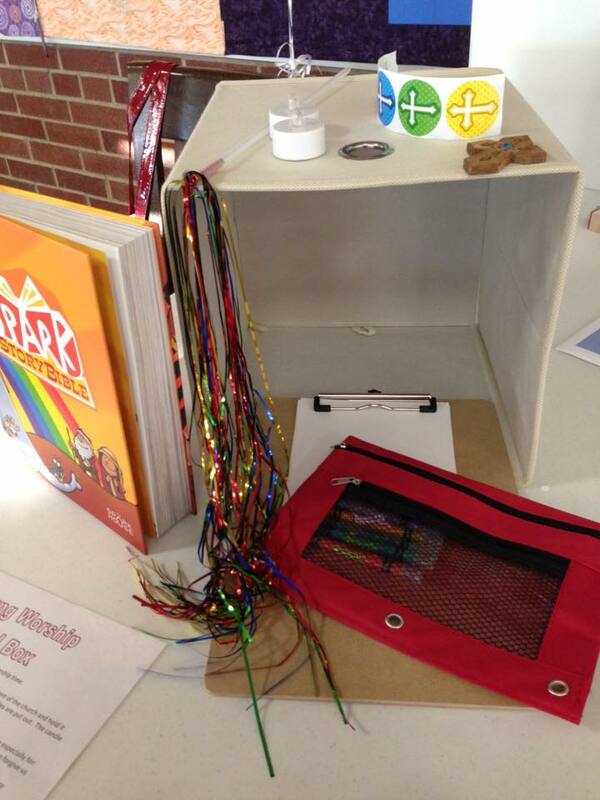 Next came a small activity table (also in the narthex) suited well for toddlers and preschoolers. Paper, crayons, children’s Bibles, and a rotation of play dough, pipe cleaners, or foam building blocks entered the scene. Then came “wiggle worship”—a session for 10 minutes during the sermon time when children ages 2-4 can go have an activity together, led by parent volunteers who take turns. But what happens when they’re too old for “wiggling”? Enter worship tool kits! These boxes are placed in the front of our worship space and include items that help preschoolers and elementary students to participate in our worship service. It’s been just a few weeks, and they are starting to catch on. Children can hold a cross during prayer time, light their own (battery powered) tea light, dance during the hymns or liturgy with a ribbon wand, and draw a picture to give as their offering to God. The items are simple and fit easily into a 10 inch canvas box (available in most home storage sections of department stores or home improvement stores). Some families have moved to the front to worship for the first time, giving their children a better view. Others pick up a box and take it with them. However they use it, we hope it will help our children learn the importance of worship and encourage the congregation to see that children have a place in our worship services together. So you allow children to bring the boxes home? Just curious. Also, how did you introduce or teach children and parents how to use these boxes? We have crayon bags and children’s worship bulletins. I love the idea of a cross for prayer and draw a picture for offering. Thank you for sharing.